The Calgary Flames hope that Blake Comeau can re-discover his game, claiming the 25-year-old forward off waivers on Friday. 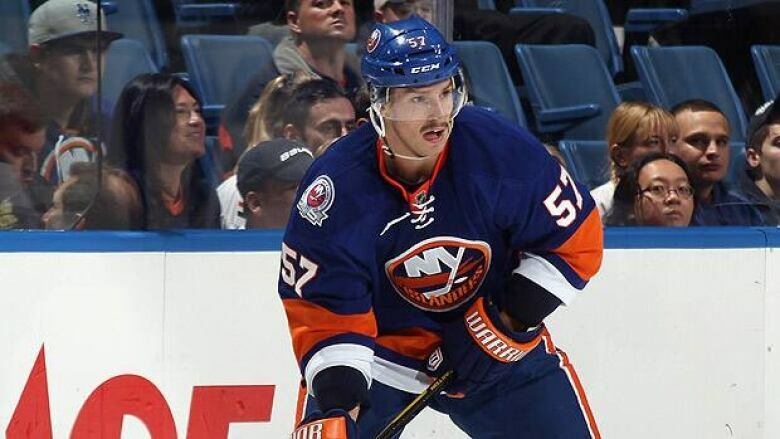 The New York Islanders waived Comeau, who had not registered a point in 16 games so far this season. The left wing was coming off career highs, with 24 goals and 22 assists last season. Comeau played for Canada's world junior entry in 2006 under current Flames coach Brent Sutter. "Blake is a smart, committed, two-way hockey player who kills penalties, is responsible defensively and can score some goals as well," Flames general manager Jay Feaster said in a statement. "We have liked this player for a long time, and our scouts and staff are convinced a change is going to be good for him. We are excited to add him to our club without having to give up an asset." The Meadow Lake, Sask., native has totalled 56 goals, 65 assists and a minus-46 rating over 261 career NHL games, all with the Isles. The Flames have been searching for chemistry up front. Captain Jarome Iginla and Rene Bourque are lagging behind last year's production standard, while the likes of Matt Stajan, Brendan Morrison and Niklas Hagman (since waived) haven't supplied consistent secondary scoring. Comeau has approximately $1.9 million US left in salary in the final year of his current contract, a total that will split between New York and Calgary. To make roster space, Calgary sent down speedy forward Paul Byron to the American Hockey League.